We stock a full range of crutches including double adjustable, anatomic handled and under arm as well as the new style Flexyfoot crutches. Crutch pads can help take the pressure off the hands and Flexyfoot ferrules are a popular additon to all crutches. Using walking aids can often be extremely uncomfortable and at times unreliable. Many people find themselves in a position where in order to get about, they have no choice but to embrace aided walking. Now though, with Flexyfoot, it no longer needs to be unsafe or painful. 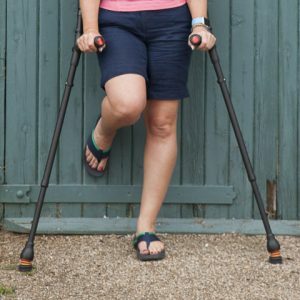 With traditional walking aids, tackling uneven ground is a frightening experience; there’s the fear of falling but by switching to Flexyfoot ferrules, you can confidently enjoy a more stable walking experience. Flexyfoot’s patented design works like the suspension system on a 4×4. The flexible bellows absorb shock each time your stick touches the ground so your step is completely cushioned. Flexyfoot provides 50% more grip, which ensures a level of user confidence. Even when it’s wet out or by the side of swimming pool, the anti-slip foot leaves you safe in the knowledge that your walking aid will not fail you. Flexyfoot provides improved grip and stability on all terrains, particularly slippery and uneven surfaces. Even better than that, the tread of the ferrule can independently rotate through 360°, so full ground contact is still maintained if you have to twist or turn around. The flexible bellows mean your stick will work at any angle while the Flexyfoot rubber tip is always in full contact with the floor. One of the core benefits of Flexyfoot is its ability to relieve pain normally associated with using walking aids. Over a prolonged period of time, traditional ferrules can cause excruciating and debilitating pain in the arms, shoulders, wrists, elbows, back and neck. Flexyfoot’s innovative spring design corrects the body’s walking position by creating suspension for the walking aid, acting as a shock absorber, in the same way the suspension on a bike or car works. Studies have shown that your wrist receives from one to more than three times your body weight with crutches, a load the upper body was never designed to sustain. Spring loaded or shock absorbing crutches or ferrules can reduce peak handle load by 24% when compared to standard crutches. This means less strain on joints, which in turn could reduce the risk of added complications associated with longer-term crutch use.